The reason you ended up on this post is either because you once made some changes on your Jenkins configuration and failed to revert back the changes which led to you having to reinstall Jenkins out of frustrations Or you just want to keep a your configurations version controlled as we all know that keeping important files in version control is critical, as it ensures problematic changes can be reverted and can serve as a backup mechanism as well. Most of my Code and resources are often kept in version control, but in most cases before it was easy to forget especially about Jenkins server itself! A system re-installation made me a fall victim and lost my information mostly about setting up Jenkins and and and. Hence, I decided to document it both for myself and the person reading this post. Thank me later! It’s pretty simple to create a repository preferably private - you will never know who is watching, but it isn’t obvious which parts of your $JENKINS_HOME you’ll want to backup. You’ll also want to have some automation so new projects get added to the repository, and deleted ones get removed. Luckily we came up with a great tool to handle this. The script assumes that the Jenkins-backup Git repository (preferably private) has already been created successfully. Jenkins is running successfully and user can access the Jenkins home directory. First we will need to initialise git in the Jenkins home directory and then create the backing up script. Once you have created your script, you need to initialise you current directory and add remote origin. By following this simple commands. git config --local user.email "fake-jenkins-user@gmail.fake"
git config --local user.name "Jenkins Automation"
Create backup script by copying the code below and saving it on $JENKINS_HOME. # Script below will commit the complete Jenkins config (including plugins and deletions) while ignoring various unwanted Jenkins droppings. # Assumes that the git repo is already configured with an upstream and an ssh key for authentication. echo "error: JENKINS_HOME is not set"
echo "error: there is no .git directory here. Make sure you're in the right place." 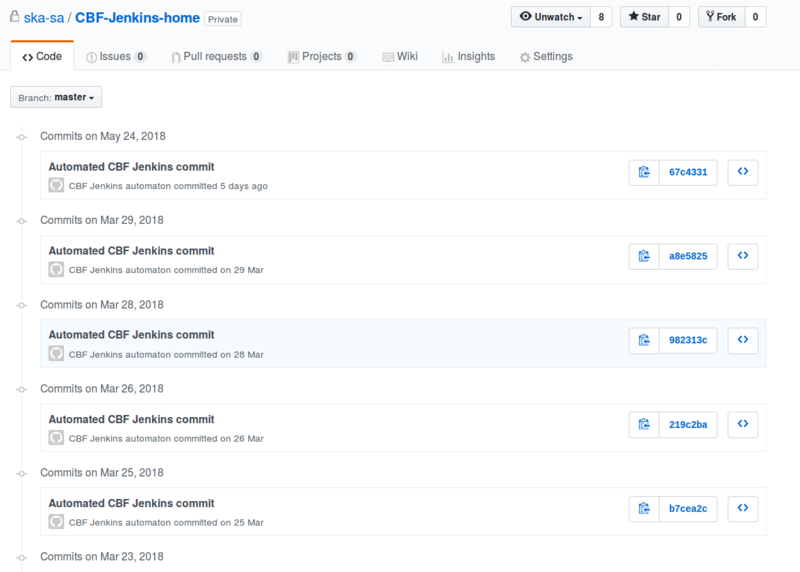 git commit -m "Automated CBF Jenkins commit"
Now the trick is, to create a Jenkins build job that will run every single day. 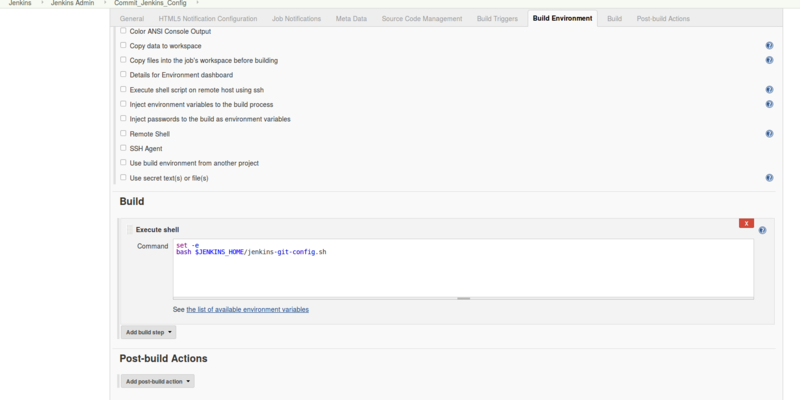 This build will execute our script which will check for any new changes, commit and push. That way if your builds starts failing due to configurations changes or you install a weird plugin that messes up your configuration - you can always check out the last known stable commit. and configured it to trigger/run daily. Added the following code, to be executed in a shell. When done, run a build and see if it will backup successfully. DOCKER_OPTS="--dns 8.8.8.8 --dns 8.8.4.4 --dns <DNS Server>"
From below image, once can see that the script actually does what it is meant to do.